fault milestone two side:above is the second installment in ALICE IN DISSONANCE’s flagship fault series, the first of which I reviewed when it was first released and both of which continue to infuriate me with their lack of capital letters. 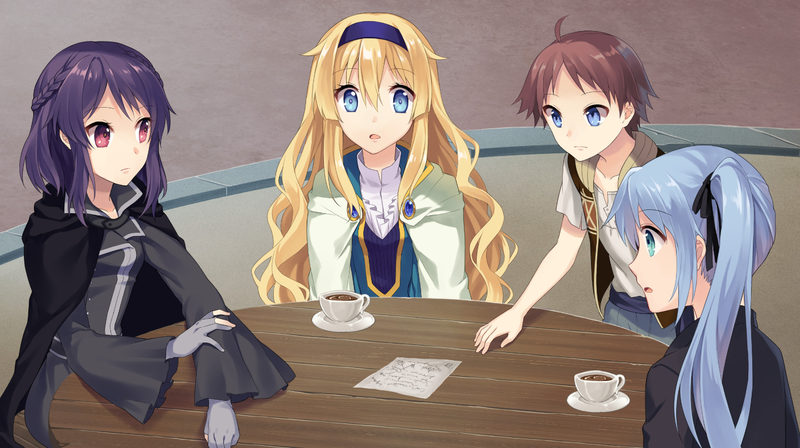 With a sound concept and likeable characters I enjoyed the first visual novel without finding it to be memorable, though I saw the potential for vast improvement in future releases. 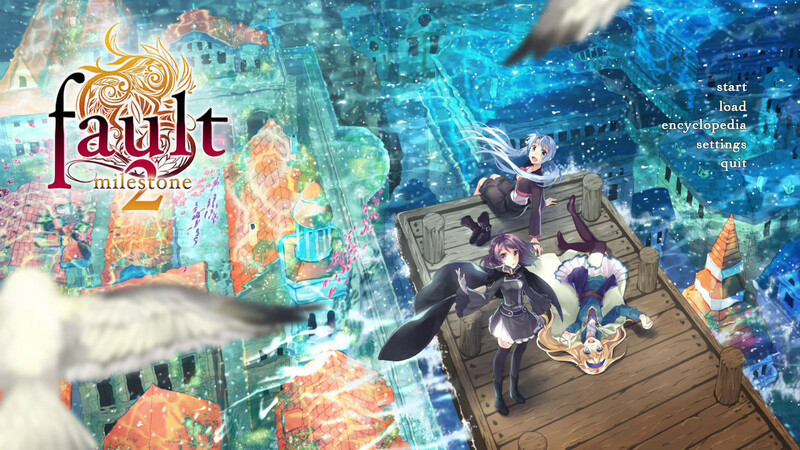 Thankfully, my faith in the series has been rewarded with a fantastic second venture into the world of fault, delving deep into what made the original good while improving upon it in a significant number of ways. 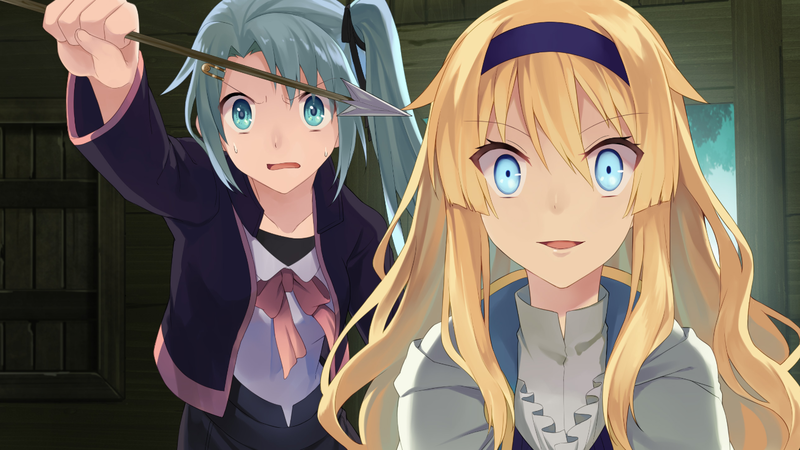 In short, the fault saga now tops my list of “ongoing visual novel series to be excited about”. Stranded in the Outer Pole, the blighted land devoid of life-giving mana, Princess Selphine and her Guardian Ritona are joined by their new companion Rune as they strive to return to the capital of their kingdom, Rughzenhaide, following the attack upon it. After breathing a sigh of relief when they enter the mana-rich lands of the Inner Pole once more, however, the group is faced with another obstacle on their path home. In Port Sasary of the coastal country of Viscanta the group meet Sol, an orphaned boy who offers to show them around the port in exchange for a fee. Amidst the wonderment inherent in the exploration of a new place, standing out is the magnificent underwater city known as Neo Sasary, built to take advantage of the life-lengthening flow of mana running through the area. Not all is well, though, as the corruption seeping through the streets of both the towns above and below the waves becomes apparent. With Ritona suffering from the aftereffects of her time in the Outer Pole and Selphine undergoing the mysterious phenomenon known as Empress Syndrome, no one could know what impact this visit might have on their journey’s success. This time around fault starts with a bang, very quickly giving the audience a preview of what the series holds in store before returning to form and focusing on a smaller story. Paradoxically perhaps, as with milestone one, I found this “small story in a big play” approach to be very enjoyable and I was also impressed by the writers’ ability to think outside of the box with relation to the narrative they were writing without any one plot device seeming out of place. Without gushing about it too much, there were a plethora of clever features/issues put to good use in milestone two and you really need to read it to experience them for yourself. With topics like discrimination, political corruption and psychiatric imbalance on display there’s a lot of excitement to be had and I’d be lying if I said I wasn’t fully immersed and entertained for the duration of the novel. The one negative comment I’ll make here is that some people will probably be put off by the teasing of some major game-changing information that isn’t well explored, though having said that I’d also say there’s enough new and interesting content to satisfy the majority of people. In side:above a whole host of new characters are introduced, further padding out the tools available for crafting future installments and while this time around we don’t get to see some of their plotlines reach fruition others make for very entertaining reading. As with the first game there’s a lot of emotion floating around and despite the use of some cliché features everything comes together to be greater than the sum of their parts. What’s really impressive, however, is how human that emotion is, making it easy to follow and get caught up in. Additionally, the new personalities do a wonderful job of facilitating the exploration of those of the existing characters, directly addressing the criticism that milestone one failed to leave an impression in that sense. One of fault’s advertised innovations is the 3D camera system, which allows the developers to represent each scene as a pseudo-3D space and it works pretty darned well. As stated by ALICE IN DISSONANCE it allows for narration via camera movements alone meaning that scenes are a lot more dynamic than in most visual novels, which I can describe as nothing other than fantastic. On top of that, I noted scenes where traditionally background elements were brought in front of the character sprites to achieve that three dimensional effect I mentioned earlier; things like leaves and grass in a forest. A small change from the norm, perhaps, though it was very nice to see. The visuals in general were similarly excellent, with a large number of CGs for the length of the novel as well as consistently good background art. In my last review I commented that there was a visible difference in terms of quality between main character and side character sprites, so I’m pleased to say that this time around that particular deficit is less evident. The audio does an admirable job of backing up its visual counterpart with some very enjoyable background tracks, though I’m once again left wishing that voice acting had been included (not that its absence makes the visual novel any less worth playing). Summary – To be completely honest I’ve had a lot of trouble writing this review, mainly because fault milestone two side:above (aside from making me glad I don’t have to write the name in full every time I mention it) is just plain good in too many ways for me to count. ALICE IN DISSONANCE and Sekai Project must have had some great writers and translators working on it to make for the immersive, entertaining experience that delivers the impact milestone one was lacking. Sure, we may not seem to be much farther along the fault timeline as a whole, and that may disappoint some readers, but this sequel adds so much to the foundation of the story as a whole that I personally cannot complain. Consider it Highly Recommended. 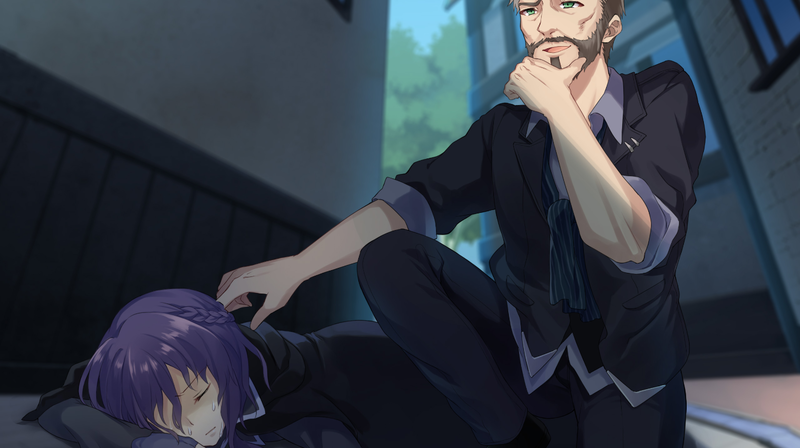 This entry was posted in Reviews, Visual Novel Reviews and tagged above, alice in dissonance, fault, milestone two, Review, sekai project, side, Visual Novel, VN. Bookmark the permalink.